We had the pleasure of chatting with Alberto Rosende, who plays the music-loving vampire Simon Lewis in Shadowhunters, over the phone last week. He had a lot of thoughts on his character’s story thus far, his romance with Maia and potential complications in the form of Jordan and Izzy, and whatever that mark from the Seelie Queen might mean. Check out his answers before this week’s episode! What are the consequences of the Seelie Queen’s brand and how soon will Simon discover its meaning? 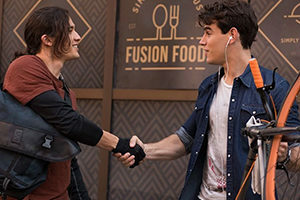 Alberto Rosende: We saw that it has very violent and dangerous repercussions, whatever this brand is, and we know that Simon does not like to be in violent and dangerous situations. So you can you can bet that’s going to be on the top of his priorities. To figure out what it is, to prevent that from happening. To be like, “What is this thing, and frankly how do I get it off? How long is this here?” That’s definitely going to be a big part, because we know Simon does not like any of what that mark now shows he’s capable of. In the books, Simon is branded by the Mark of Cain? Is this the show’s take on that moment? Alberto: I don’t know as of yet. In the books, the Mark of Cain was given by Clary, not by the Seelie Queen. So there is a difference, and our showrunners do a great job of doing new things in a different way. You know, taking things from the books and doing it our way. That still lends itself to that, but also creates a new story for all of our old fans so they don’t feel like [it’s something] they’ve already seen. So it’s somewhere in the middle; I don’t know if I can say. Smooth sailing so far. But for how long? Can you talk about the vampire-werewolf tensions developing, especially in light of Simon’s relationship with Maia? Alberto: Absolutely. We knew that going into a relationship with a werewolf as a vampire was gonna present its own challenges, and now we’re starting to see the beginning of that. Is it a coincidence that it happened right after the Seelie Queen ominously warned Simon that wherever he walks in the daylight, darkness will follow? I don’t know, but I definitely think that there’s going to be consequences because technically Simon’s one of the pack living there outside the Jade Wolf, and he just angered another wolf. So how that plays itself out, with Luke gone… There’s a bunch of things, and it’s true of the Shadow World that things get worse before they get better. Simon’s gone through emotional and physical transformations in the last two years. What’s been your favorite part of his development? Alberto: I think it’s his ability to keep moving forward, to keep waking up every day and saying, “Alright, I’m just learning.” Essentially, imagine this: he’s lived for eighteen years knowing the world to be one way, and then in the matter of a few months everything has changed. Now he’s literally just a little kid again, trying to relearn with the awareness of an adult. Imagine how frustrating that must be, to be someone that young but have an awareness that only counts for half of the knowledge that you need. Very frustrating, very difficult. Thus far, Simon’s relationship with Maia has been much less frustrating than everything else in his life. Why do you think they work so well together? Alberto: I think it’s their connection of being mundane first. Clary became a Shadowhunter which is like the elite of that world. Shadowhunters decide the rules, whereas Simon and Maia became Downworlders. Downworlders have this weird double life, kind of a mundane life and kind of not. And with Simon being a Daylighter, it’s even less normal for a vampire. He’s the only one, so he’s lucky to have Maia there to really be able to ground him. She’s someone else going through it that knows a little bit more about the Shadow World, but is still relatively on the same page as him, figuring it all out. Chai Hansen shakin up Simon’s world as Jordan. We know Jordan Kyle is coming to town soon, so what can you preview about his dynamic with Simon and how might that affect Simon and Maia? Alberto: I don’t know how much I can speak to that. I don’t know how much I remember, because we just got the script for episode 18, we’re shooting 16 and 17 [where] things got weird… One of the things that really grounds our show and makes it cool for everyone to watch, and makes it a little bit more than just a fantasy show, are the relationships that people have. Our relationships are very grounded and real. Jordan Kyle and Maia have a relationship, and Jordan has a new relationship to the Shadow World, which is the reason why he and Simon meet. Naturally, everyone’s going to be affected by that new energy coming into the group. We’ve also heard that Simon and Isabelle will be sharing more scenes in 3B. Can you talk about that relationship? Alberto: I can definitely say that Simon and Izzy have more opportunities to be in the same room together. And they’ve always had this cool closeness that we’ll see a little bit more of. What’s one episode coming up that Simon fans should really look out for? Alberto: The last three episodes of 3A, so 8, 9 and 10. I think 9 more specifically. [It’s] a really cool episode where Simon goes through a lot, there’s a new character that could cause a lot of problems… So yeah, episode 9, that’s as much as I can say. Who do you want to see Simon spend more time with? And what adventures do you hope to see him undertake this season? Let us know in the comments, and don’t forget to tune in to the newest episode of Shadowhunters on Tuesday, April 3rd at 8/7c on Freeform.